My house is on the edge of a hamlet nestling in the hills. The perfect choice as a base for your self catering holiday. Unwind on the terrace soaking up the sun and views, re-tread ancient footpaths winding into the hills, explore famous cities of art or just relax on the beach! Sample the real Italian food and wine experience from little country Trattorias then get away from it all at your holiday villa. Only 2km from the village of Valdottavo with shops, bars and restaurant for your immediate requirements and remember the famous city of Lucca is only 20 min by car. Furnished in traditional style No.11 offers 2 spacious bedrooms, one double & one twin, bathroom, sitting room, kitchen/dining room with log fire for winter evenings, panoramic, intimate covered terrace accessed from ground floor, plus another large front terrace with dining and barbecue facilities where you can enjoy to the full (hopefully with a glass of wine) sunsets and long summer evenings. About Lucca: The whole area is rich in historic and cultural interest. Castello lies approximately 17 km. north of the ancient walled city of Lucca. It is a charming and beautiful city, with its priceless art treasures, narrow cobbled streets flanked by imposing palazzos, secluded squares, gardens and Romanesque churches. Whilst retaining all the elements of its age and history one finds sophisticated shops and restaurants. On the third weekend of every month there is a fantastic antiques fair which lasts for 2 days Throughout the summer months there are various classical and contemporary music festivals. On top of the medieval walls which enclose Lucca are wide and shady tree lined avenues. Here the locals cycle, walk their dogs and promenade. There are grassy ramparts ideal for relaxing after sight seeing or you can hire bikes and ride around the 4 km of wall. A great way to see the city from up high. About Castello: Like so many Tuscan settlements, Castello clings to the side of a hill overlooking valleys, hillsides and mountains with terraced vineyards and olive groves in the foreground, and beyond, wooded slopes and picturesque villages. It is a peaceful place, totally unspoilt. It retains a traditional way of life and has been home for generations of Italian families who still cultivate the land. In the Spring of 2003, BBC2 screened a 'reality TV' documentary series concerning British families o wishing to relocate to another country. One of the programmes in the series follows the fortunes of a family wishing to relocate to Tuscany, in the Lucca area. The beginning of the programme shows the family viewing a handful of properties in the area and choosing the one that they would most like to live in. They chose my house in Castello and lived there for the duration of the filming. They, like me, fell in love with Castello and the house and playfully tried to persuade me to sell it to them. The house was acquired as a complete ruin and my husband lovingly restored it with great character using original materials in keeping with it's rustic history. As he is no longer with us, it is a great and lasting tribute to his skill. I lived in number 11 with my son for 10 years. I now live in the UK and work as a Nurse in the NHS. I get to Castello as much as I can. The house is simple and rustic reflecting it's history as a farm worker's dwelling. It's stones are steeped in history. It remains part of a little community, my neighbours were born and bred in Castello. For anyone wanting an authentic, beautiful little countryside retreat as a base for exploring this remarkable and magnificent area of Tuscany then Castello 11 is perfect. Peace and quiet after day trips to the cities of art. West facing covered terrace to enjoy the sunset. Nature all around you from the wild flowers in the olive groves to the swallows in the skies. Breathtaking views all year round. A decent sized village only 5 mins away for amenities and Lucca, the beach, the mountains, the cities of art and Pisa airport all just down the road! The bathroom at castello 11 is equipped with full size bath with shower attachment and shower curtain. There is also a wash basin with large mirror, a bidet and WC. The bathroom has 2 large windows both glazed with mirrored glass from the outside for privacy which means you can lie in the bath while admiring the views! There is a hair-dryer and a wood and glass wall cupboard for storing toiletries. Gas central heating is available.The gas is metered and I charge separately at Castello for usage. Sheets, pillow cases, bath towels, hand towels, bath mats tea towels may be hired from me. Payment is due at Castello. The washing machine is in the 'catina' This is the storeroom below the house. The property has a WiFi internet connection. Beach towels are not provided. Hand and bath towels are available to hire. Upon reservation a linen hire form is provided. I provide crockery and cutlery for 5. A range of saucepans, frying pans, oven proof roasting/serving dishES. There is a dining table inside the house for 4& people and dining tables on both of the terraces too. The large terrace to the front of the house is enclosed but you are a stones- throw away from olive groves fields and woodland which surround Castello and which you are free to explore. There are two terraces a large uncovered terrace to the front of the house and smaller covered terrace accessed from inside the house both have stunning views over the countryside and mountains. All linen for your stay is available to hire from me on a weekly basis or you are very welcome to bring your own. Payment according to number of guests is set out in the facilities information in the linens provided box and should be made at Castello to my manager. Sun loungers and garden furniture are provided. In low season the changeover day can be flexible. What a wonderful week we had here in this glorious setting. We have been looking forward to this ever since we booked. The views were magnificent, opening the shutters and listening to the birds and distant bells were the ‘stuff of dreams’ . We were aware of the drive up to Castello especially the last 200m, even so on our second trip up we damaged the wheel. So please be extra careful on your approach. Many thanks for your review, I'm so glad you enjoyed your stay in Castello. Peaceful retreat after busy days just what the doctor ordered. 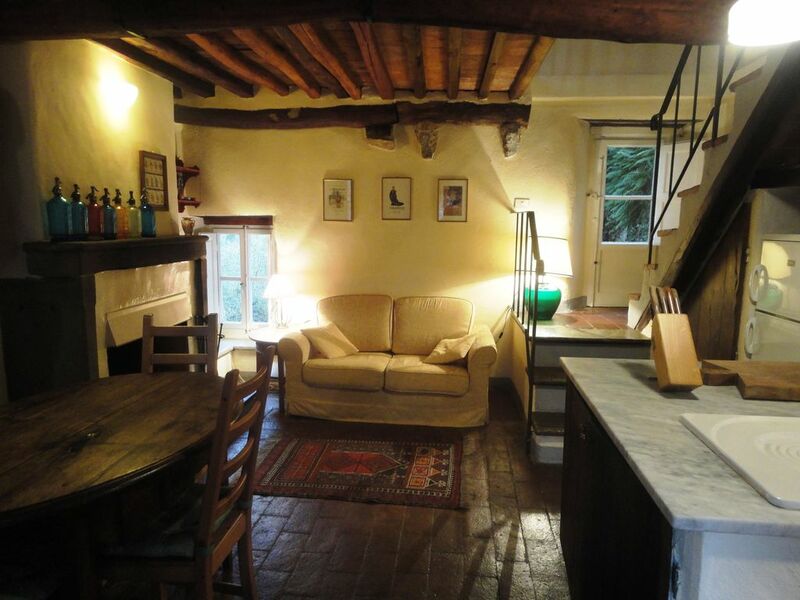 Really beautiful typical Tuscan country cottage. This was a stunning place to stay. Amazing views, very characterful house, which was more spacious than I imagined. Peaceful, yet a very realistic 25 minute drive to Lucca. Just as you would imagine a peaceful countryside retreat. If I hadn't already seen that the owner wouldn't sell, I'd be asking! Wunderschönes altes charmantes Haus in herrlicher Lage oben in einem kleinen Weiler mit fantastischem Blick über das Tal. Wir haben besonders die Aussicht vom Balkon aus genossen, dies war unser Liebingsplatz zum Essen und Lesen. Daneben gab es noch einen schönen Sitzplatz auf der Terrasse, zu jeder Tageszeit findet man bei Hitze ein schattiges Plätzchen rund um's Haus. Hier leisteten uns oft zwei nette Katzen Gesellschaft, die sich immer über eine Futterration gefreut haben. Lucca ist eine wunderschöne Stadt (hier gibt es auch einen großen Esselunga-Supermarkt zum Einkaufen mit toller Auswahl), Florenz haben wir mit dem Zug von Lucca aus besucht. Ansonsten gibt es Wanderungen in der näheren Umgebung, leckere Restaurants finden sich nach 10-20 Minuten Autofahrt in der Nähe. Wir werden auf jeden Fall wiederkommen, wir waren alle drei begeistert. Myself and my wife stayed at Castello 11 for eleven nights. The house is lovely, characterful and cool inside. The balcony with tiled roof is just so lovely to sit on - great view looking down on the valley on trees and olive groves whilst for most of the day in the welcome shade. The valley bottom church bells chime softly in the distance. The dawn chorus birdsong and view from the ground floor double bed were lovely. The village of Valdottavo with some shops on the valley floor takes 5-10 minutes to reach by car down the narrow and steep road that winds up the hill and is a bit challenging especially the last 200m stretch which has a jagged rock face and sharp turn. Parking is 50 yards from the house. The nearest big town of Lucca takes about 20 minutes to drive to and it is simply lovely. The big car parks round the outside are free, with just a few minutes walk into the walled town. Lucca has many piazzas. Our favourite was Puccini which was a bit quieter than the others and had some nice restaurants reasonably priced. We much preferred Lucca to Florence. We thought it was prettier, much less busy and churches were free to go in. Walking from the house in the nearby woods was nice in the shade, but fairly energetic as quite hilly. We were sad to leave such a lovely spot. We (couple + dog) enjoyed a wonderful week in this very well-equipped, well-maintained and lovingly decorated country home. We found everything according to the description. The houskeeper Anna was very friendly and helpful, especially with the centralheating that was absolutely necessary as we stayed around Easter of 2017. Castello is just 17 km north of Lucca, one of the most beautiful cities in Tuscany and just 2 km from the friendly village of Valdottavo. Heading north a short distance from Castello, is the Spa town of Bagni di Lucca with it's fabulous open air spa-water swimming pool and spa treatment centre. Then there is the historic walled city of Barga not to mention many beautiful hidden villages to explore and skiing at Abetone, an hours drive away. The delightful Cinque Terre -5 amazing little fishing ports - on the Ligurian coast line are a must do and less than an hour from Castello, along with Porto Venere .Florence is an easy trip just over 1 h. Siena and San Gimignano about a 2 hour drive away. The beach with lively cosmopolitan resorts like Viareggio, Pietrasanta and Forte dei Marmi and miles of golden sand is about 45 minutes away. Pisa Airport is 45 min by car and Florence airport about an hour away. There are excellent motorway and rail connections from Lucca. For stays of less than one week please contact me for availability and rates. Prices quoted are for four persons; the charge for a fifth guest is £10.00 per night. There is no charge for one child under the age of three years with four visitors. A cot and high chair are available at £20 a week inclusive. Prices include electricity, gas; (excluding heating) and hot and cold water. Personal Insurance & Cancellation Cover. In the extremely unlikely event that my house becomes unavailable due to circumstances beyond my control, I reserve the right to cancel a booking and will refund any payment that you have made to me in full. I strongly recommend that you take out personal insurance at the time of booking to include cancellation cover. If you have to cancel your visit, you should do this in writing at least 6 weeks before your holiday is due to begin. If you do cancel you will receive a 50% refund of the total cost of your booking. I reserve the right to retain the full cost of the booking on cancellations made less than 4 weeks before the start date of the booking.